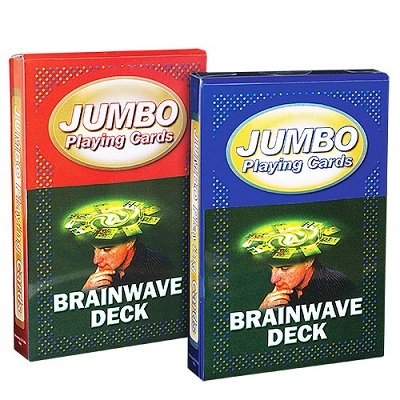 Finally on sale a jumbo playing cards deck, perfect for performing the "Brainwave deck" also on stage. Its size is ideal: it is double a standard poker size deck, yet smaller than a classic jumbo deck. The magician places a deck of cards on the table locked into the case. A spectator thinks freely of a card and names it. The magician takes the deck opens it with his hands and shows how a single card is turned face up. Clearly it is the named card from the spectator, which will also be the only one with the back different from the others. An effect of big impact on the public because the card is freely thought. The spectator can name any card in the deck. Cards are cm 9,5 x 14,5 (about in. 4 x 6).